​Climate change impacts are strongly evident in Kenya’s arid and semi-arid lands, which cover 82% of the country’s total land area and host close to 70% of its livestock. Over the last 10 years, persistent drought, high temperature, and depletion of water sources has led to a 21% decline in livestock as a livelihood source in northern Kenya’s Garissa County. Crop production has also been severely affected by drought, occasional floods, pests, and diseases. These factors contribute to Garissa’s 70% poverty-index rating (compared with the national average of 48%, according to government figures). Results from climate modelling and downscaling techniques also indicate that by 2100, mean temperatures will increase by 3-4°C, further limiting water availability for livestock and pasture. 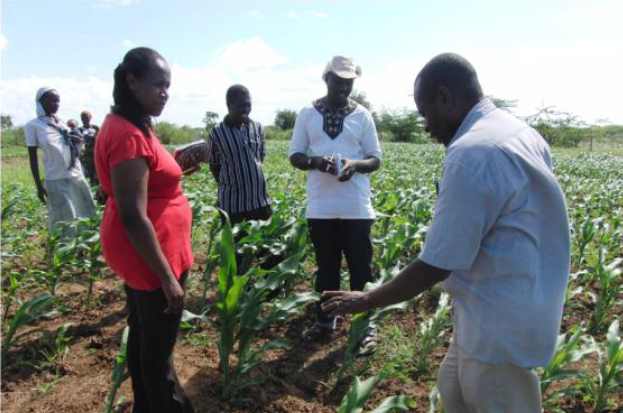 IDRC-funded researchers at the Kenya Agricultural and Livestock Research Organisation (KALRO) are working with farmers in Garissa County to help them adapt to a changing climate and secure their livelihoods. The research team and farmers tested a wide range of technologies and management practices for improved livestock productivity, which are suited to changing climatic conditions. Drawing on advice from extension officers and the research team on breed selection and herd management, pastoralists saw a 50% increase in livestock productivity by raising climate-resilient goats, sheep, camel, and cattle breeds. This increase in productivity will also allow the pastoralists to reduce herd sizes, in turn reducing overgrazing and soil erosion. Farmers learned new techniques for producing livestock fodder, with important outcomes for household food security. For instance, one acre of Sudan grass can produce 3.6 tons of cattle feed in a year, enough to feed three cows (a typical household herd) during the annual four-month dry season and for the cows to produce sufficient milk for a family of four. Alternatively, sale of the fodder can generate revenue of up to US$1,160 per year, equivalent to average annual per-capita income in Kenya. Farmers explored how they can diversify production and reduce vulnerability to climate-related crop disease caused by over-reliance on a single crop (such as maize). They tested a range of alternative crops that perform well despite climate shocks and variability, including sweet potato, sorghum, cassava, beans, and finger millet. Of those farmers who participated in the research, 65% are now producing sweet potato to feed their families and for sale in markets, where they are earning up to $US110 per ton. Legume varieties were also found to provide multiple benefits: they improve soil fertility and soil moisture retention, double as cover crops, and can also be used for household consumption or to feed livestock. At the start of the project, 188 farmers were involved in testing technologies. Now, more than 800 are using the improved methods. Even greater numbers of farmers are being reached through demonstration sites, farmer field schools, study visits and exchanges, and theoretical and practical field days. The research team has actively engaged a wide range of stakeholders, including different levels of government, since the project began. Many of the research results are now being captured in County Integrated Development Plans, and all counties have since committed funding toward scaling up successful technologies. For example, the Tana River County government invested US$18,000 toward the purchase of 4.7 tonnes of drought-resilient seed for distribution to farmers. National government officials have also invited KALRO researchers to help develop Kenya’s National Climate Change Action Plan and the National Communication on climate change, which will be submitted to the UNFCCC. The success of drip kit irrigation for horticultural production has attracted a private investor, Equator Kenya Limited. The company provided drip kits to 300 farmers in Tana River for chilli production (through loans of US$74 per kit). One drip kit can irrigate one acre of chilli, generating an annual average of US$1,400 per acre for farmers. These collaborations will help to ensure that research findings on improved agricultural techniques have widespread application, and that they contribute to protecting farmer livelihoods and food security in Kenya’s arid and semi-arid lands. The project "Agricultural Productivity and Climate Change in Arid and Semiarid Kenya" is funded through IDRC's Research Initiative on Adaptation to Climate Change in Asia, Latin America, and the Caribbean with funds from the Government of Canada's fast-start financing. Bill Morton is an Ottawa based writer.